GREENVILLE, S.C. - Sept. 29, 2016 - PRLog -- Harley-Davidson of Greenville turns up the pink by announcing its participation in October's "National Breast Cancer Awareness Month." For the entire month of October Harley-Davidson of Greenville will be hosting events and activities centered around raising money for a local biker battling Breast Cancer. We here at Harley-Davidson of Greenville do this in remembrance of Sandra L. Crawford who lost her battle after two and a half years in 1998. She was the mother of our dear General Merchandise Manager, Kris Slusser. When her battle ended she left behind a loving husband, two children and 4 grandchildren. She was a motorcycle enthusiast and lived each day like it was her last. Each of us knows someone that has been effected by this awful disease. We are requesting if you are a biker in the Greenville area or know of one battling Breast Cancer send us your story. We will be raising money throughout the month and will donate all profits to a chosen individual at the end of the campaign. All stories need to be submitted no later than Saturday, October 15 to chesley@h-dog.com. Check out the events and activities we have going on throughout the month below to help give a little more peace of mind to a stranger or friend to help them focus on the fight! There are a lot of expenses that a family incurs when undergoing cancer treatment. Help Harley-Davidson of Greenville give to a family in need during this trying time. Help us decorate the windows of the showroom with Bras for a Cause. Bring in your painted or decorated bra to be voted on by the public and receive a FREE Pink bandanna. The bra with the most votes will win a $50 gift card to Victoria's Secret! The earlier you bring your bra to Harley-Davidson of Greenville the more opportunity you have to receive votes. For $5 you will get three ping pong balls for a chance to make it into a bra cup and win a prize. Join us on Saturday, October 22 from 11 am - 2 pm at Harley-Davidson of Greenville for a Chili Cook-Off benefiting our biker with Breast Cancer. There will be live entertainment, corn hole and beer! Open to the public, only $25 to compete, just $8 to eat and vote. Kids 6 and under are free. With $500 in cash prizes there is no reason why you wouldn't want to enter that famous chili your friends, family and neighbors rave about! 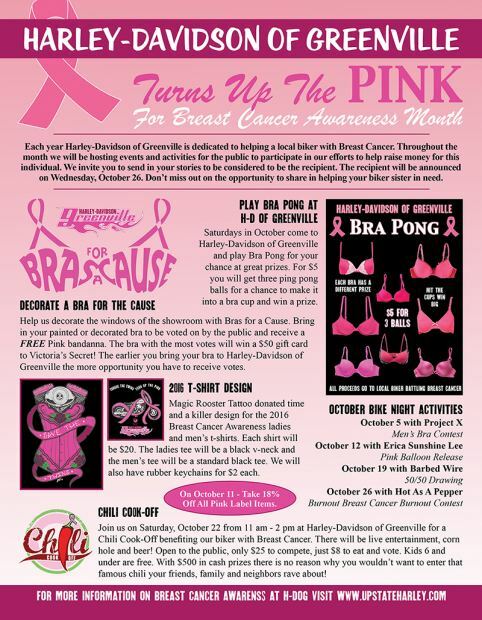 For more information on Breast Cancer Awareness month at Harley-Davidson of Greenville visit www.upstateharley.com. Harley-Davidson of Greenville offers customers high quality merchandise with the upmost respect to our customers and the Harley-Davidson brand. Our number one priority is to service our customers to the best of our ability and help them live the dream of owning a Harley-Davidson. We are dedicated to making Harley-Davidson of Greenville a comfortable and trustworthy environment for Harley-Davidson enthusiasts of all ages and walks of life. We carry pre-owned and new Harley-Davidson motorcycles and offer top-quality service and repairs. Our parts department services customers with Genuine Harley-Davidson Motor Parts and Accessories, as well as aftermarket parts and accessories. The General Merchandise and MotorClothes department offers Harley enthusiasts all they need to make the ride more comfortable and enjoyable. Harley-Davidson of Greenville is Your Upstate Harley Dealer and is located in Greenville near Spartanburg, Columbia, Anderson, SC and Asheville, NC.